SCOTTSDALE, Ariz.--(BUSINESS WIRE)--Barrett-Jackson, The World’s Greatest Collector Car Auctions®, is set to auction the prized John Staluppi Cars of Dreams Collection during the 16th Annual Palm Beach Auction April 12-15, 2018, at the South Florida Fairgrounds. One of the most notable private collections on the East Coast, Mr. Staluppi owns a diverse group of American cars – predominantly convertibles – from the ’50s, ’60s and ’70s, along with custom vehicles and Resto-Mods. 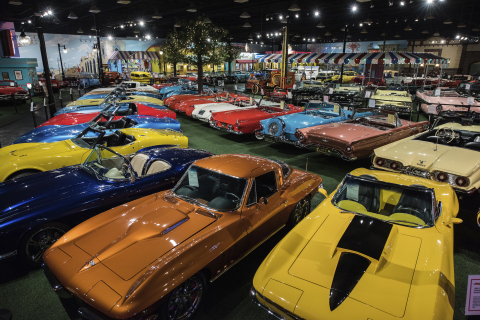 More than 140 vehicles currently housed in his North Palm Beach Cars of Dreams Museum will cross the block, all at No Reserve. Staluppi, also known for his empire of auto dealerships and collection of superyachts, has been a car collector for decades. A few of the crown jewels in the John Staluppi Cars of Dreams Collection include a ’58 Dual Ghia Convertible, a ’69 Chevrolet Camaro RS/SS Indy Pace Car, a ’65 Chevrolet Corvette Stingray Convertible, and a ’63 Volkswagen Beetle better known as “Herbie,” which was used in several of the iconic Walt Disney films. The philanthropic nature of Jeanette and John Staluppi was on display at the 2018 Scottsdale Auction when former U.S. President George W. Bush slammed the gavel following Staluppi’s $1.4 million bid on the first 2018 Corvette Carbon 65 Edition. One of many charity vehicles purchased over the years by the Staluppis, 100 percent of the sale from the Corvette will benefit the former president’s Military Service Initiative. For more information on becoming a bidder for the 2018 Palm Beach Auction, including the highly sought-after John Staluppi Cars of Dreams Collection, follow the link to www.Barrett-Jackson.com/bid. To consign a vehicle for the 2018 Palm Beach Auction, click here. Established in 1971 and headquartered in Scottsdale, Arizona, Barrett-Jackson, The World’s Greatest Collector Car Auctions®, is the leader in collector car and automotive lifestyle events, which include authentic automobilia auctions and the sale of high-profile estates and private collections. The company produces auctions in Scottsdale, Arizona; Palm Beach, Florida; at Mohegan Sun in Connecticut; and Las Vegas, Nevada. With broadcast partners Velocity and Discovery Channel, Barrett-Jackson features extensive live television coverage, including broadcasts in over 150 countries internationally. Barrett-Jackson also endorses a one-of-a-kind collector car insurance for collector vehicles and other valued belongings. For more information about Barrett-Jackson, visit Barrett-Jackson.com or call 480-421-6694. For high-resolution photos, please contact Aaron Cook at ACook@TPRM.com.